Guess who finally got her first Darn Good Yarn subscription box?!? THIS MAKER!!!!! And I absolutely love it. 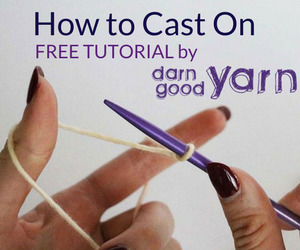 For your subscription, you get one box per month that includes a skein of premium ‘Darn Good Yarn’ yarn (or another brand of artisan quality yarn), a crochet pattern & a knit pattern and a surprise gift. My first box included Darn Good Yarn worsted weight silk roving yarn, a knit cowl pattern, a crochet cowl pattern, and for my special gift — a set of Ombré Purple wooden knitting needles and a crochet hook. Side Note: Not only were the needles and hook purple, but so is the subscription box and DGY’s logo and branding. I’ve had this obsession with all things purple since I was 8 years old (hence my new logo). Almost 20 years later, and my obsession has only grown stronger. Lol. The subscription is only 10 bucks a month, which is such a steal when you consider everything you’re getting. And the patterns are easy to follow, granted you have some knowledge of crochet and knit terminology. I haven’t learned to knit just yet but I plan to use the knit pattern from this box as my first official knitting project. Overall, I must say that this monthly subscription is definitely worth trying out. And I can’t wait to see what I get in next month’s box. Use the link below to get your first subscription box!